Origins came out with a nice little Gift Set for the Holidays called Go Ginger (that included one of the products I’d been dying to get my hands on for years, but never could, due to shipping restrictions and such). I’ve said this numerous times before on my blog but the best time to invest in Gift Sets is during the Holidays, because every brand releases all kinds of Gift Sets; some that include a few of their best-sellers (in a variety of sizes), some focused more on new releases and Limited Edition products, others with the aim of getting you more bang for your buck (Value Sets) and other still include a combination of all of the above. Plus, you get to try your hand at things you normally wouldn’t try because you would never purchase them on their own. 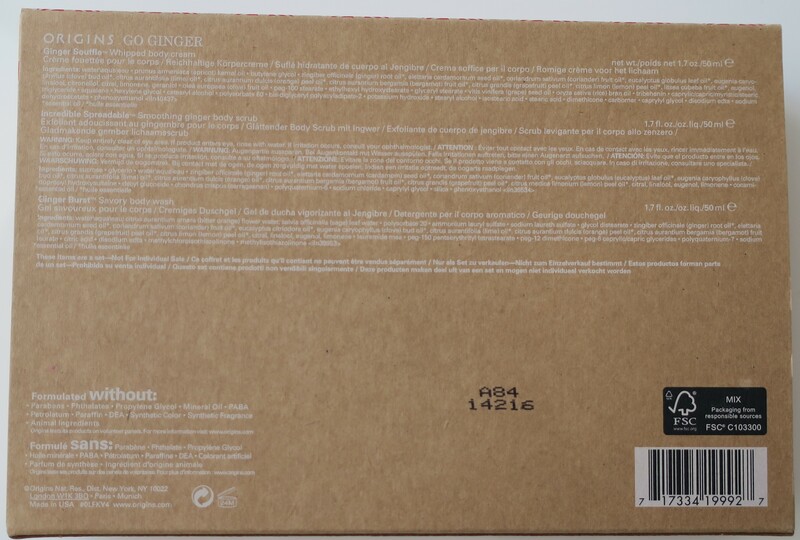 As soon as I spotted the Go Ginger Holiday Gift Set, I added it to my online shopping cart. I also got a cute Facial Brush (yellow) that bumped up the total of my order, which qualified me for free shipping (to my U.S. mailbox, only) and a free Canvas Tote Bag and some samples (x4)! With that being said, Origins come out with new promotions and such pretty regularly (spend X amount and get this and that for free, or spend X amount and we knock off a percentage off your total, etc…) so it’s worth waiting for a deal that appeals to you, before placing your order. Everything arrived in tissue paper, with a sticker of the Origins logo keeping it neatly packaged. Which I promptly tore, to reveal the goodies! Not sure if I’ll get any use out of this Tote Bag but regardless, this thing is huge! Unveil radiant skin with the Origins Facial Cleansing Brush; a simple yet highly effective tool that improves your daily cleansing regime. Suitable for all skin types, the small face brush features soft bristles that gently exfoliate skin and sweep away dead cells, dirt and impurities that can cause dullness. It maximises the results of your cleanser or can be used with water alone, revealing refreshed and brighter looking skin. I enjoy using any and every tool that’s meant to be used in the shower to cleanse your face or body. I’ve got everything from a Clarisonic (and several dupes from other brands) to those Silicone Face Exfoliating Scrubbing Pads to Cocoon Silk Fingers Puffs (from Daiso), not to mention the more common Face Polishing Towels and such. So when I noticed this Facial Cleansing Brush, I figured I could use it in conjunction with some of my less abrasive Face Scrubs, Face Wash, etc… to maximize their effect and increase their potency (or just scrub my face raw lawl). 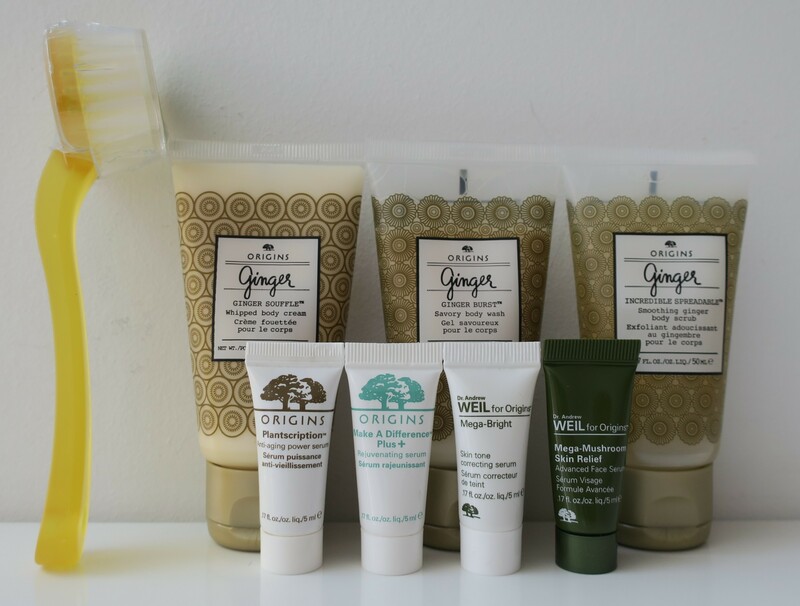 Our scent-sational body treasures treat skin to the warm wonders of irresistible Ginger. It’s a totally tangy experience! The Gift Set included a Body Wash and Body Scrub and Body Cream, all showcasing the main ingredient, Ginger (hence the name, derr). Guess which product I was dying to try. If you guessed Body Scrub, you were correct! I wanted to try the Incredible Spreadable™ Smoothing Ginger Body Scrub so badly, for years and years! Sadly, it was only ever available in the huge 21.2oz/600g jar. However, as part of the Gift Set, it came in a much more palatable 1.7oz/50ml tube, as did the rest of the trio in the Go Ginger Gift Set. That’s why I ordered a Go Ginger Gift Set for myself immediately after I spotted it. This was my chance to finally try the Incredible Spreadable Body Scrub (even its name sounds awesome)! I’d been obsessing over this stuff because supposedly upon contact with your skin, it actually heats up your skin! You know when you use a minty product and you get a cooling sensation? Well, this is the opposite! It warms up your skin! Like, wuuuuuuut? I mean, can you imagine using this stuff during Winter? Also, it’s got a SAVORY scent, which in and of itself is rather unique! It’s not my most favorite scent in the world but at the same time, I can’t help but keep wanting to go back and giving it another sniff. I guess it’s one of those scents that slowly grow on you. In any case, for all of the reasons above (and then some), I was obsessed with this stuff (even though I could never get my hands on it before, due to shipping restrictions) for all those years, so I’m glad that I finally could and did! Cleanse and soothe skin and feel warm all over. This stuff smells delightful, is sufficiently frothy and warms up my skin! Buff away rough dryness. Soften, cleanse, and refresh skin. I was most excited for the Body Scrub but was quite disappointed. For starters, it didn’t even warm up my skin. The scent was pleasant enough. However, I’m not sure if it’s because this version came in a tube (Body Scrub) and the other version came in a huge jar (Body Buffer) but this stuff wasn’t nearly as abrasive as I would’ve liked. Sadly, this just wasn’t worth the wait. Surround skin in a cocoon of softness and feel uplifted. 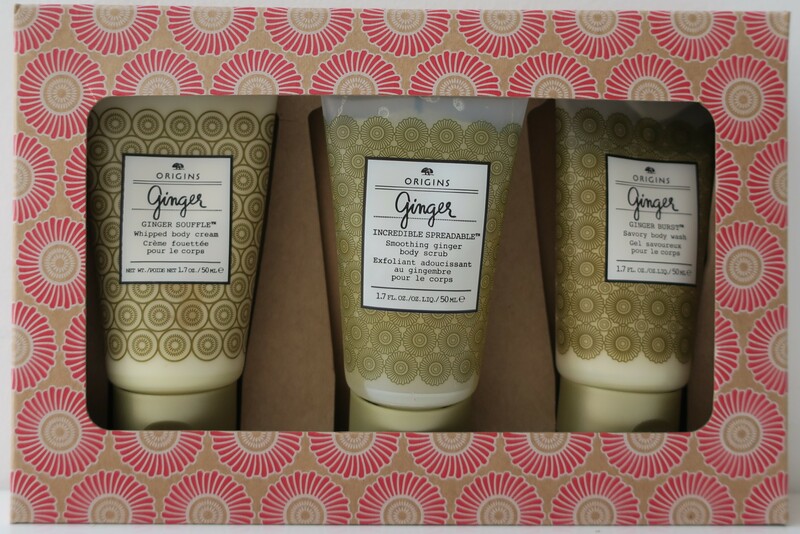 Smells of Ginger infused with Bergamot and Citrus and leaves your skin feeling soft! Not everyone will enjoy the scent, but I quite like it! I guess you could say it’s an acquired taste. I also got my pick of 4 free samples so I went for ones that were anti-aging, since I’m getting older (and probably in dire need of the stuff). This Power Serum helps unlock a new path to visible wrinkle reduction. In just 2 weeks, this powerful age-fighting Serum helps visibly improve lines and wrinkles. With continued use, it helps lift and firm to reveal a more youthful appearance. Origins went around the world to power up our most potent anti-ager. It’s now formulated with a total of 20 targeted anti-aging plant extracts including Anogeissus from Ghana, Bamboo and Pea Extract from Australia, Crithmum from France and Commiphora from India to name a few. And we used them to create our newest anti-aging cocktail. Line-reducing cocktail helps rebuild a supportive network. Give skin resilient bounce to act like the box springs of a mattress. New plumping cocktails helps plump upper skin layers. Create a less wrinkled appearance at skin surface. Boost skin density to act like the pillow top of a mattress. Help empower skin to rebound from ageing dehydration. Help restore youthful looking smoothness to reduce the appearance of fine, dry lines. This rejuvenating, oil-free treatment fortified with Nature’s miracle rose of Jericho plus a breakthrough lychee and watermelon hydra-sustain complex quenches deeper than ever before to help repair the natural moisture deficiency in dry, dehydrated skin. This Plant Serum with rejuvenating Rose of Jericho, Trehalose and Sea Haricots helps keep skin happily hydrated. Skin looks and feels dewy, healthy and revitalised. It is clinically proven to instantly boost skin’s moisture reservoir to keep it hydrated and rejuvenated all day. Go to the light. This highly concentrated Serum is fortified with Dr. Weil‘s natural light-infusing complex including Rosa roxburghii, White Peony and Licorice. It helps visibly reduce dark spots and correct skin tone. Dull discolored skin begins to return to the light, appears more translucent and luminous. It’s spot on for turning spots off. This potent Serum with Reishi Mushroom, Sea Buckthorn & Fermented Chaga rapidly reduces visible redness & restores resilience. Skin looks & feels healthier. Leaves sensitive skin calm & comforted. My Holy Grail Mascara, GinZing (reviewed here) is from Origins, but they’ve also got some other pretty decent products as well. 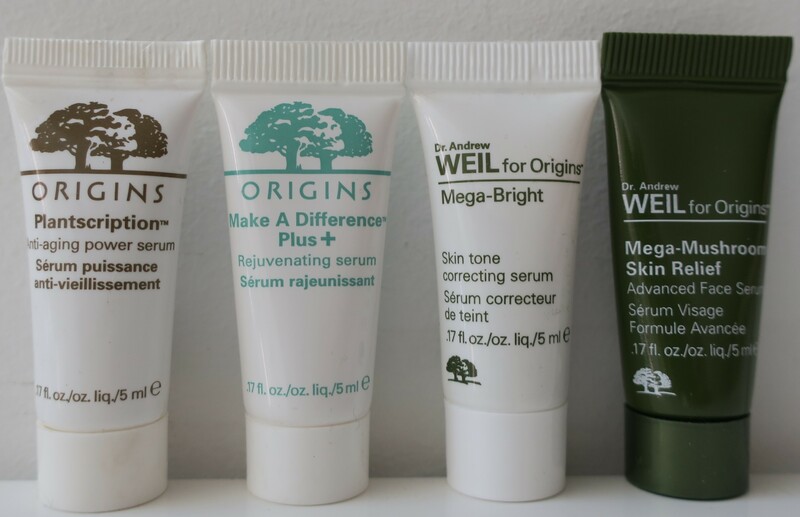 If you’re into eco-friendly brands that are constantly planting trees and such (750,000 trees and counting), use renewable energy (such as wind and solar power) to manufacture their products, and use a blend of ingredients from nature (renewable resources), plus non-toxic alternatives, plus advanced science to create their products, then definitely check out Origins!